The 3rd Annual Granada Grand Festival of the Arts heads back to Downtown Ormond Beach with more artists, more activities and more music than ever before. Ormond Beach MainStreet and the Ormond Beach Arts District will host this free arts festival Saturday, September 17th, 2016 from 10 AM – 5 PM behind the City Hall complex on South Beach Street. This is the festival’s third year in Ormond Beach’s River District neighborhood. The Granada Grand Festival of the Arts offers a generous helping of all things art, from visual artists and art demonstrations to musical performances and hands-on activities for the whole family. More than 3000 visitors joined us last year. As you wander around the festival, you’ll surely get lost in a flurry of sights, sounds and smells. Interact with select artists as they conduct live demonstrations of their technique, then snag the perfect gift from one of more than 60 accomplished area artists selling unique, handcrafted pieces of work. Admire the work of our chalk artists. Grab a mouth-watering bite from a string of local food trucks, stroll with a glass of wine or beer in-hand or visit our Calypso lemonade stand. On the main stage, local bands provide the sound track for the day, while student performances and dance groups take over a second stage. Even the smallest art-lover will stay entertained in our kid’s zone, hosting fun art projects for all ages, face painting and a bouncy house. This year, more than ever, festivalgoers will have a chance to “be part of the art” – with an interactive community project for all ages. Ormond Beach glass artists Tommy and LC Tobey will be inviting the community to help create a glass mosaic art piece. The design will be reflective of our historic downtown with a touch of nostalgia! The public will be able to work on the glass mosaic, adding a piece or more to create the final vision. Tommy and LC want to evoke a sense of community and fun while bringing out the artist within during this unique interactive display of art. The finished artwork will be donated to Ormond MainStreet for public display. Frame of Mind Art will be bringing creative energy to the kid zone with craft projects and a pedal-powered spin art station, while Florida Hospital Memorial Medical Center will sponsor a free video booth where kids (and adults) can ham and glam it up for their video feeds. For those who want to know more about how to DIY, four artists will be offering demonstrations throughout the Festival. Linda Davis of Wyoming Prairie Alpacas will demonstrate fiber art, Becka Mezera will show pottery techniques, Luis Martinez will teach contemporary painting and Sandi Johnson of SandiKat will show off Gyotaku, the ancient Japanese art of fish rubbing. 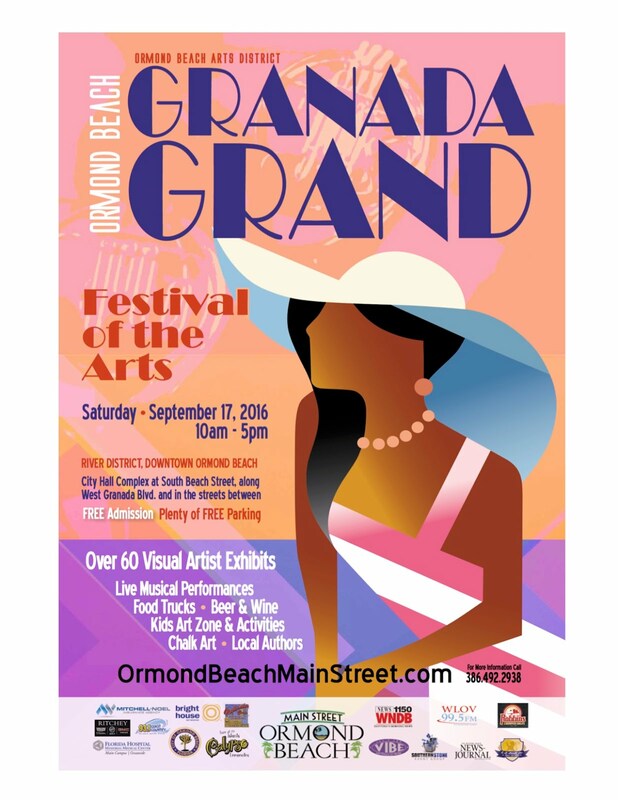 An updated schedule of Festival events and a parking map are available on the Ormond Beach MainStreet website at www.ormondbeachmainstreet.com/granada-grand-festival-of-the-arts. The Granada Grand Festival of the Arts is sponsored by Ormond Beach MainStreet and the Ormond Arts District as part of their mission to make downtown Ormond Beach a premier destination for residents and visitors to live, work and play. 3:15 pm – Daytona Playhouse Radio Theatre presents the classic radio comedy – “Jane Finds a Mate for her Mother! A few artist spots are still available. For more information on becoming a sponsor or vendor at this event, please contact Becky Parker at Becky@ormondmainstreet.com or by phone at (386) 492-2938.